A food allergy is when the body reacts inappropriately to a food protein. Intake of the particular protein stimulates the immune system and anti-bodies to that food protein are produced. The next time that food is eaten, there will be a severe reaction because of the antibodies present. Most people are only allergic to one or two foods. The most common food allergens are cow's milk, egg, wheat, peanuts, seafood and possibly soybeans. Food allergy is easy to recognize, as reactions usually occur within minutes or hours after the food is ingested. The reaction usually occurs every time when even small amounts of the food are eaten. This occurs when people are sensitive to particular chemicals in a food. They can react to chemicals found naturally in foods, or to the artificial flavouring, preservatives and colours added to foods. The most common ones are salicylates, benzoates and amines. Food Intolerance may be more difficult to diagnose, as reactions occur due to a build up of chemicals. This can take several days and it is difficult to identify specific foods. Can I have both food allergy and food intolerance? Some people with asthma, hayfever or hives may have food allergies and food intolerances. Both food allergy and food intolerance can contribute to symptoms of asthma, hives and hayfever. If you feel you are suffering the symptoms of a possible food allergy or intolerance, visit your doctor or allergist to be assessed and tested. Food allergies may be tested by skin pricks or blood tests. Food intolerances must be tested by removing and re-introducing foods. If you come out with a positive skin prick test or blood test, this means there is probably a food allergy. The next step is that the food should then be tested under controlled conditions with the help of a doctor or dietitian. A reaction to the food will indicate food allergy, and this food should be removed from the diet. A positive blood test may not always mean you will react when that food is eaten. For example you may react to wheat in a blood test but not notice any increase in symptoms when bread is eaten. In this case it could be the grasses and pollens in the air rather than the actual food. An elimination diet will usually involve all food chemicals being excluded. If the symptoms improve then each food chemical group is re-introduced individually to establish tolerance of each chemical group. It is helpful for people to know which factors (food or environmental) make their symptoms worse. If pollen levels are high and offending foods are consumed at the same time then a severe attack could occur. It may be fine to include small quantities of offending foods when other triggering factors are not present. 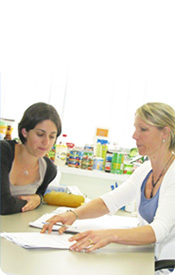 A dietitian will take a detailed dietary history and address each individuasl lifestyles. They will then design a diet to suit your particular food allergy or intolerance. This may involve removing a particular food, food group, or chemical group. Elimination diets and trials may be run to determine the exact foods that should be omitted. Care will be taken to make sure that the over all nutrition is still met. The Perth Diet Clinic deals with allergy to wheat, yeast, milk, dairy, nuts and seafood, plus intolerances to salicylates, amines, benzoates, glutamates, artificial colours, flavours and preservatives. This will be suitable for individuals with any food allergy or intolerance symptoms, including asthma, hay fever, urticaria, migraines and at times irritable bowel syndrome.